The year is 1933. As the depression ravages the US economy and psyche, one particular industry is booming: bank robbery. 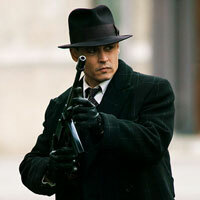 And the master of the trade is the fearless John Dillinger (Johnny Depp), America's first ever Public Enemy No.1. 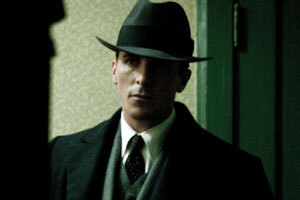 No jail can hold him, no police squad can hunt him down – but J Edgar Hoover (Billy Crudup) is determined that his fledgling force of G-men, led by upright lawman Melvin Purvis (Christian Bale) and equipped with the latest crime busting scientific equipment, will do just that. Dillinger, meanwhile, is having too much fun to stop, fatalistically hurtling towards inevitable destruction as, one by one, his friends and associates are stripped away until what began as an audacious game becomes a matter of desperation. Like French gangster Mesrine thirty odd years later, Dillinger understands the power of the press and is jealous of his reputation as the Robin Hood of bank robbery, a popular figure in these troubled times. Yes, while no 'earliest memory' biopic, the film makes it clear that there's more to the man than a cheeky grin as he guns you down. The ever-marvellous Johnny Depp captures to perfection Dillinger's complex mix of charisma and ruthless aggression: able to turn on the charm like a tap, his wooing of girlfriend Billie Frechette (Marion Cotillard) makes you yearn for the good ol' days when men were men and women sat around waiting to get swept off their feet, but he can also turn nasty on a dime. Nobody captures the frenetic, chaotic adrenaline rush of a shoot out like Michael Mann, yet he is at pains to glamorise neither the outlaws nor their FBI hunters. His loose, documentary style, using handheld cameras jostled by crowds and darting wildly round as the bullets fly, allowing him to revive gangster clichés of cops and robbers riding shotgun on the running boards of Ford Buicks, tommy guns rattling, trilbies firmly in place, and make them seem brand new. Admittedly the film does get confusing at times, with the naturalistic dialogue mumbled and too many men that look the same in their impeccable 1930s tailoring. A side plot about powerful underworld bosses chafing at the onset of nationwide law enforcement in the wake of Dillinger's cross state predations emphasises the way in which organised crime is gradually usurping good ol' fashioned, opportunistic, individualistic, shoot 'em up bank robbery but doesn't really go anywhere. But nevertheless, this is a fine, emotionally absorbing film that captures the spirit of the age in a gritty, modern way.